ONE-OFF MMS MAY 2018 20 mmsonline.com dkorn@mmsonline.com Derek Korn EXECUTIVE EDITOR @mms_derek Collaboration Is Key to Company's Comeback 2017 was a particularly trying year for Dotson Iron Castings. Yet, it was that year that the Mankato, Minnesota, foundry's character and resiliency shined through. A fire started around 11 p.m. Friday, September 22, destroying and damaging equip- ment and sections of the building's molding area, where sand molds for iron castings are made. Three molding lines were lost as well as all elec- trical, pneumatic, water-line and sand-conveyor systems. The final tally for damages was more than $5 million. Thankfully, none of the 12 employees working that evening were injured. Liz Ulman, one of Dotson's vice presidents, points to transparency and collaboration as being two key factors that helped the company get back online in five weeks. "Prior to the fire, our management team had established a general plan of action to respond to such a catastrophic event, including creating an employee evacuation plan," she explains. "In fact, that was one reason why no one was hurt that evening. However, you can't meticulously plan for every possible scenario. That's why before the fire was extinguished early the next morning, our leadership team was already on site and imple- menting a very specific recovery plan." One of the team's first actions was to contact all employees who were scheduled to work Monday morning and ask them to show up as usual (even the five new hires who were scheduled to start that day). Although the employees' roles in the recovery-effort roles were unknown at the time, management wanted them to know that they were all important members of the Dotson team. In fact, all employees remained on the payroll during the rebuild, even those not directly involved in the recovery efforts who the company paid to volun- teer at various community organizations. Dotson also demonstrated its comeback com- mitment by setting a clear, firm goal of being back to pouring iron by October 23. 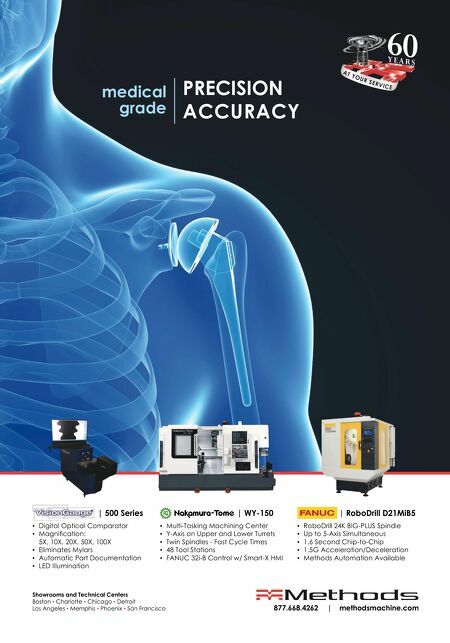 This took around- the-clock efforts on some people's parts, but the company achieved that common goal. Throughout its recovery efforts, the company also tried to be as transparent as possible, provid- ing regular updates to customers and employees. It also worked with industry partners, some of which were competing foundries, to minimize the disruption to customer orders. "Throughout this process, we also learned the importance of not just going back to how we used to do business," Ms. Ulman says. "Instead, we looked for opportunities to optimize our operation, even in small ways, to improve our relationships with our customers, to improve our relationships with our employees, and to use this unfortunate situation to better position our opera- tion for the future." Not surprisingly, the company is being recog- nized by the Manufacturing Leadership Council as a 2018 Manufacturing Leadership Awards winner for outstanding achievement in collaborative innovation for its disaster-recovery efforts. Keep Dotson's story in mind as you consider how your shop might react to such a dire situation. 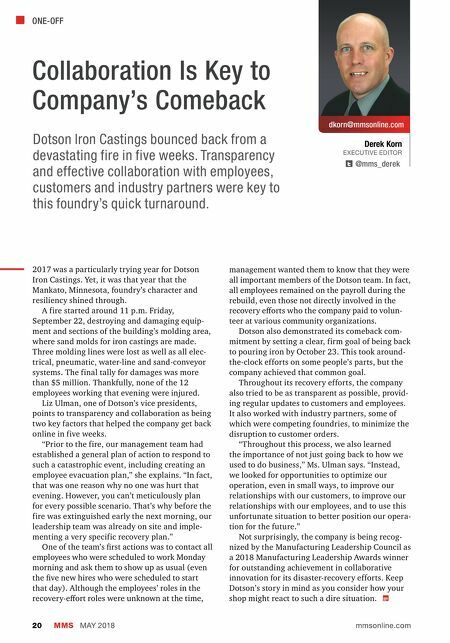 Dotson Iron Castings bounced back from a devastating fire in five weeks. Transparency and effective collaboration with employees, customers and industry partners were key to this foundry's quick turnaround.